Humans have shared a strong bond with horses since the beginning of time. A horse can be a loyal companion as a pet, providing a level of understanding to humans that not many other animals can match. The connection that horses have with humans may be an extension of horses’ behavior in their natural habitat. Horses value their family, and are very inviting towards other horses of their herd as well. This kind of warmth in the behavior of horses has found its way to the human world, and a strong bond has developed between the two species. This bond is celebrated all over the world, and festivals like the Grand National and the Cheltenham Festival are held annually as a result. At Cheltenham Racecourse, a festival is celebrated on Saint Patrick’s Day and is very popular with Irish visitors. This year, they have a variety of horses ready to show off their skills and looks, with one very special horse that is suited up for the action. Sir Tony McCoy, a champion jockey from the UK, has just revealed the world’s first prototype of a three-piece suit designed purely for a race horse. It was tailored in assistance with famous veteran racer, Morestead who executed the look with a flat cap. The team also included William Hill, who commissioned the task, and designer, Emma Sandham who is an apprentice of the famous designer, Alexander McQueen. After four weeks of work, the outfit was ready for the horse. The suit is made of 18 meters of authentic tweed, shipped all the way from the aisle of Harris in Scotland. This exquisitely tailored suit utilized ten times the amount of cloth required to make a suit for an average man. Tweed is so popular among people in the United Kingdom that specialist, Doctor Geoff Ellis went on to find out that the amount of tweed worn at the Cheltenham Festival by users is enough to reach from the historic racecourse to Ireland. The commissioner of the project, Sir William, also examined 32 large scale crowd photos taken from the festival to inspect the quantity of tweed on show. He found out that, on average, 321.5km of tweed are worn annually by spectators. 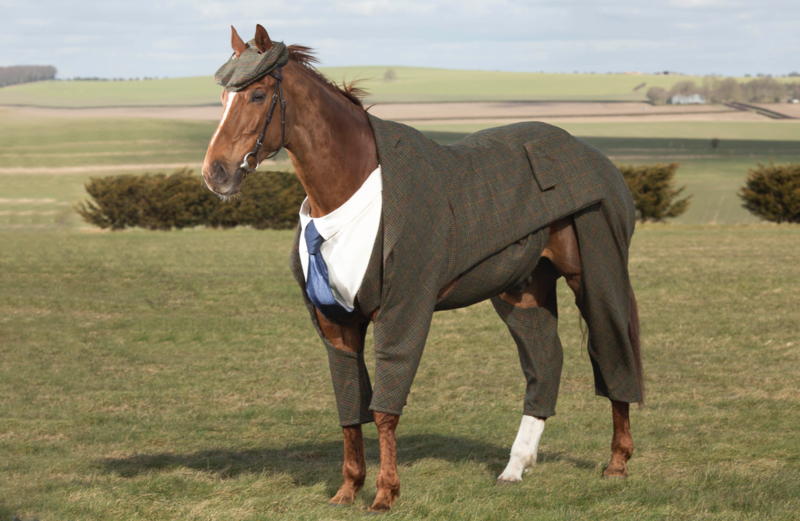 That’s a whole lot of tweed, and explains why the designers of the horse’s suit decided to go with it over any other type of cloth. The Cheltenham Festival is a much anticipated event by all horse lovers around Europe. Sir Tony, who has been through 31 events, talks about having many loving memories of racing his horse at the Cheltenham Festival. But while he doesn’t race anymore, you'll still see a number of other jockeys suited up and ready to show off their talent on the event. If you love horses and horse-related events, be sure to turn up at the Cheltenham Festival on Saint Patrick’s Day to show your love and support for such events.